Main target of the highland-fishing are the huge ice-age-brownies. The season starts end of June and lasts until mid of September; earlier the lakes can be frozen and unfishable. The trout are either caught on nymphs or on streamers; if the conditions are right also on dry flies . Highland trips are available in several variants; guided or non-guided, you can sleep in a tent or in a hotel. See some more pictures of the highland fishing here: additional pictures. OCTOBER 2011: In the German magazine Fliegenfischen my article about the highland trout was published. Here you can donload the article from issue 6/2011. Here you can read it. 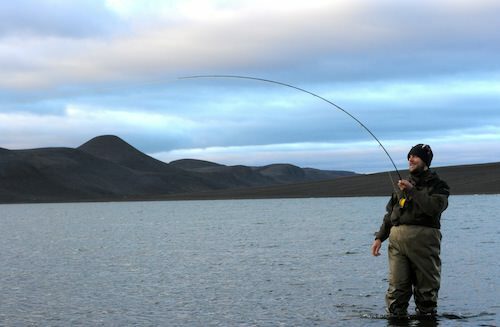 highland trout – a fly fishing adventure in iceland from Jan Stüeken on Vimeo. After arrival in Keflavík International Airport you are driving through the amazing Icelandic landscape towards the highlands. 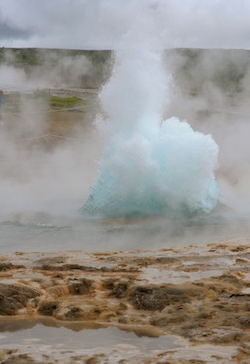 Some of the “must sees” of Iceland are located on the way, e.g. the geyirs close to a village with the same name. Here you get a real feeling of the volcanic activity in Iceland and you might spend hours trying to get a photograph of erupting Strokkur , the biggest geysir. The higher you drive up into the highlands, the less vegetation is available. Fewer trees, landscapes made from cold lava, coated by green moss, remind you a bit of the lord of the rings. Suddenly the asphalt road turns into a gravel road – from now on you have to have a four wheel drive. 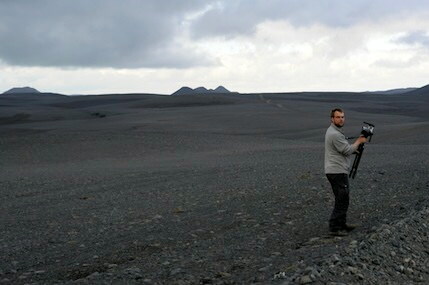 Everything looks a bit like on the moon, however made from black sand. Single dots of colour are rusty, green and blue lichens, which dip the mountains in fantastic colours. After some more kilometres you arrive the highland lakes. These three lakes were created several hundred years ago during an eruption of a volcano. You feel the vulcanic activity by accidental sulfur smells and old vulcano craters.Everything feels surreal and you cannot imagine one single fish to live here. However, they do live here, actually a lot of them. The lakes are located far away of any civilisation and it is only possible to get permits there since a few years. The iceage-trout are originated from the icage as their name says. This species is growing so big due to immense amounts of midges and sticklebacks. If you are there on a day with hardly any wind combined with a midge hatch, you can experience outstanding dry-fly fishing. Those big brownies are sipping small midges from the surface and you are able to catch them with small midge imitations. Regardless of the size of the fish, they all are extremely strong. We were warned to have at least 100metres of backing on our reels which made us smile…during fishing these lakes we learnt quickly that this amount might be needed if you hook a big one. Those trout have more power than equally big char or salmon. Accomodation and meals here in the highlands depends on your preferences. Adventurous in a tent, rustic in a hostel or a cosy hotel. There are offers for each of these options. 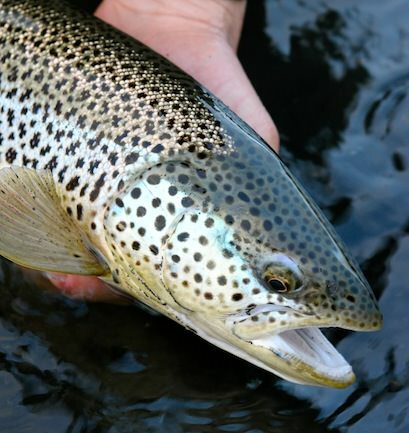 You can eiter extend your fishing by some days of fishing for salmon, trout / char or sea-trout. Another possibility is to do non-fishing activities like horse riding, hiking etc. We cal even tailor your itinary for combining your fishing holidays with family activities while you target the fine salmonids of Iceland. Contact us with your preferences and we will be happy to tailor your holidays together with you.